(CNN) Welcome to the future. This is the best of Shanghai, home to more than 20 million residents, 6,000 high-rises (and growing) and a constant chorus of jackhammers. It’s a city striving to set all the benchmarks for the modern world. The commercial hub was developed by far-sighted European traders 160 years ago and it remains the destination for people who can’t wait to experience tomorrow today. Our best of Shanghai guide shows you how to enjoy the sprawling city’s — past, present and future. And, yes, there’ll be enough fun even for visitors who suffer from vertigo. The Waldorf Astoria occupies one of Shanghai’s oldest buildings: the restored 101-year-old former Shanghai Club. With giant chandeliers, neo-classical ceiling carvings and original marble floor tiles shipped from Sicily a century ago, the interior feels more like a royal palace than a hotel. Most of its 260 rooms are located in the newly built 24-story tower. Many deliver unobstructed view of Lujiazui’s skyscraper forest. Rooms are decked out in nostalgic American style, with modern plush touches such as large walk-in closets, Herms bathing amenities and digital TVs embedded in the mirrors. The hotel’s historic Long Bar (34 meters from end to end) mixes the city’s top-notch cocktails. Currently the highest hotel in mainland China, the Park Hyatt provides the best angle to view Shanghai: from the top. 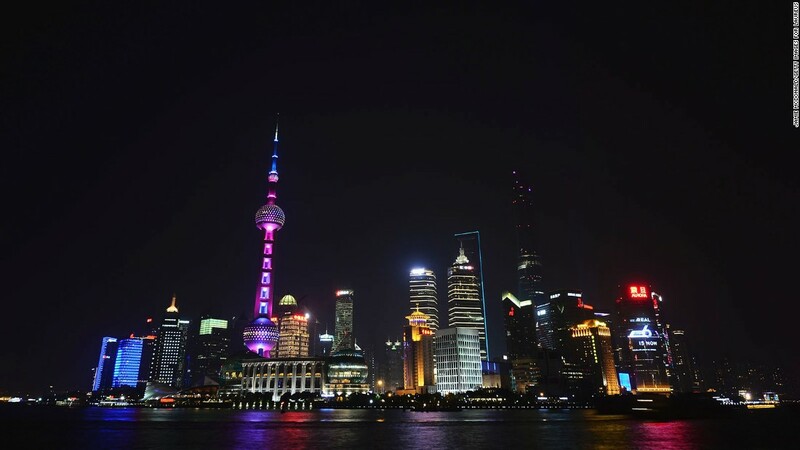 Occupying the upper part (79th-93rd floors) of the 492-meter Shanghai World Financial Center, all 174 rooms enjoy stunning vistas overlooking Lujiazui high-rises, the Huangpu River or the Puxi downtown area. Interiors follow a streamlined Chinese style with earth-tone furniture and outsize bathrooms that include a one-square-meter walk-in rain shower. The hotel lobby is on the 87th floor. On the 93rd floor, Music Room bills itself as the world’s highest nightclub. Located in a protected historic building, this best of Shanghai hotel is for travelers who want to trade Lujiazui’s gridlocked avenues for the tree-lined streets of the former French Concession. The 15-story, 259-room Picardie sits opposite Xujiahui Park, one of the best locations in town to observe China’s unique park culture: you’ll see massive exercise groups at dawn and a public dancing spectacle at dusk. It’s also a quick stroll from Shanghai’s traditional bar district on Hengshan Lu, the shopping district of Xujiahui and Metro Line 1. One of the first hotels in Shanghai built to receive international travelers after the Chinese economy opened up to world trade, the 520-room, four-star lodging is in the thick of things. It’s a few steps away from Nanjing Xi Lu (ground zero for high-end shopping) and the fabulous Jing’an Temple, a 780-year-old Buddhist shrine. Two metro lines and the Yan’an Lu elevated highway are right outside, so guests can zip to any part of the city quickly and without hassle. This 26-room boutique hotel in downtown Jing’an District was once a post office and now claims to be China’s first carbon neutral hotel. The renovation, which was completed using 100 percent locally-sourced and recycled materials, has won numerous awards for its sustainability and design. Located on a local street, across the road from one of Shanghai’s best little tonkatsu joints, URBN is popular with visitors looking for innovative design and a green feel, with rooms over-looking a courtyard and bamboo garden. The food and beverage options are also none to shabby at URBN, with its Downstairs restaurant serving up delicious weekend brunch options accompanied by a mean Bloody Mary. For starters, the check-in desk is attached to a bar. Right behind the front desk, there’s a pool table. Pentahotel’s lobby also includes a caf, a games room and a restaurant. Guests tend to chill and socialize in Wi-Fi-covered areas. All 250 rooms are fitted out in a minimalistic style with views over downtown residential buildings. The hotel is near three metro lines. This no-frills hotel chain provides all the basics for a short stay for the price of a few drinks in a ritzy bar. Location is superb for the price. The 159-room inn is within walking distance of many tourist attractions, such as Old Town, People’s Square, Huaihai Zhong Lu and Xintiandi. It’s also at the south end of Yunnan Nan Lu, one of Shanghai’s original food streets with some of the city’s yummiest shengjian (fried dumplings) at Da Hu Chun (, 71 Yunnan Nan Lu, near Jinling Dong Lu). The budget hotel brand operates at some 85 branches all over Shanghai, from commercial zones to airports and railway stations. This Shanghainese restaurant is housed in a 1930s colonial villa. Instead of a dining room, guests eat in private rooms furnished with antiques. On a menu of tweaked Shanghainese specialties, diners will find everything from traditional hongshao rou to creamy huangyu (yellow croaker) noodle soup served in a mug. Modern dishes include goose liver poached in sake. Shanghainese food critic Shen Hongfei () recommends the crab with egg white, a delicate, creamy dish brought to the table in an actual eggshell. With its curmudgeonly waiters and tiny, crowded dining room, the original Jesse location on Tianping Lu isn’t just a meal, it’s an experience. It’s the creamy crab roe potato soup that wins her over every time. Shen Hongfei votes for the Shaoxing-wine-marinated crab, a best of Shanghai dish that’s popular with locals. For an appetizer (or dessert), the xin tai ruan is a sweet dish of red jujubes stuffed with soft, glutinous rice cake. Two of Jesse’s signature dishes, the eight treasure duck and green onion fish head, require 24 hours notice. This Peninsula restaurant cooks some of the best Cantonese dishes in Shanghai. “It’s so rare to see such classic Cantonese food,” says Shen Hongfei. To make the most out of the meal, book the eight-seat chef’s table, prepared by executive chef Dicky To. Peking duck is the star at this Chinese regional restaurant. The Hyatt recruited two Beijing master chefs and lugged a seven-ton brick oven from the capital especially to roast the ducks to crisp and lacquered perfection. The open kitchens allow diners to admire the shining fowl roasting over a fire of fruitwood logs before they’re brought to table, sliced and served with sugar for dipping. Tea, fruit plates, Wi-Fi, board games, shoeshines and even manicures are provided to customers for free. The restaurant chain boils hot pot 24/7. The meal itself embraces a staggering choice of vegetables, meat and seafood that diners cook themselves in a bubbling pot of broth placed in the middle of the table. Hot pot soups range from super-spicy to plain and diners get to DIY their dipping sauce. The hand-pulled noodles are prepared tableside with a kung fu-style noodle dance. The brand hosts a virtual dining service in two locations in Shanghai and Beijing. Xiaolongbao is Shanghai’s favorite snack food and everyone in Shanghai has an opinion about where the best xiaolongbao in town can be found. There are many excellent options around town, but many visitors unfortunately usually end up at tourist traps in Yu Gardens, or at chains such as Din Tai Fung. A very respectable example of the specialty can be had from Fu Chun, in the downtown Jing’an District. Popular with locals, this place is perpetually busy with diners ordering Fu Chun Xiaolongbao (RMB 6 for six dumplings) and Crab Roe Xiaolongbao (RMB 16 for six dumplings) in ample quantities. During public holidays, massive crowds of travelers swarm Qibao Old Street for a view of the canals, or to snap that atmospheric photo of morning haze dancing around the neighborhood’s scenic bridge. But for locals, day trips to the water town are about one thing only: food. Numerous hole-in-the-wall restaurants along the 400-meter-long street sell an extensive assortment of local snacks, from xiaolongbao to stinky tofu to tuang tuan. Flair is the crowning glory of the Ritz-Carlton Shanghai, Pudong. The rooftop bar’s interiors were created by Japanese design gurus Super Potato, but the real draw is the terrace. Standing approximately 250 meters in the sky, this is the highest bar terrace in the city, with tiered sofa-seating that looks onto the financial district’s skyscrapers. Drinks cost RMB 80 and up for cocktails. Sashimi is flown in daily from Japan. When the skies are clear, call ahead to book a table and ask if there’s a minimum spend that day. This plush club/bar/restaurant remains a favorite of the city’s beautiful people. It takes up the 24th floor of a building between People’s Square and the Bund and affords staggering views toward Pudong or Puxi city center. Shark tanks run the length of the entrance, while uniformed waiters and bartenders shake up pricey drinks (RMB 80-120 for cocktails). The door staff often turn away non-members when it gets crowded, so it doesn’t hurt to dress up or call ahead to book a table (minimum spends of around RMB 5,000 often apply). Since opening in 2010, The Apartment has become one of the most popular bars in Shanghai. It takes up two floors plus a roof garden in the center of the former French Concession and attracts a crowd that’s upscale without being pretentious. In the daytime, the rooftop is a leisurely place to eat and sip wine — drinks cost RMB 50-80. At night it gets rammed with cocktail-sipping, well-dressed Chinese and foreign guests, and stays that way until 4 a.m. or so. This dim, smoky room is the go-to place for jazz aficionados in Shanghai. Inside, it’s like a Parisian bar from the 1950s: a cluster of small round tables spilling out from a low stage, with a long bar at the back and a gallery up top. There’s live music here every night, from Gypsy jazz to swing and blues. Drink prices are around RMB 50 for wine and RMB 70 for cocktails. This best of Shanghai nightclub fills up on weekends so come early — or very late — if you want a table. The best of Shanghai sports many flavors of karaoke bar (or KTV, as they’re known), from seedy to five-star. Cashbox is somewhere in the middle — fun, inexpensive and hugely popular with a young crowd. The Fuxing Park branch is next to a couple of Chinese clubs. On weekends, it swarms with well-dressed youths. Guests book private rooms that seat eight to 20 people. Bring your own drinks or order beer and spirits from the house. Rooms run around RMB 200 per hour, depending on size and number of guests. This chain of bars is wildly popular in many of China’s second- and third-tier cities and since they opened their first Shanghai incarnation it’s become apparent that the formula works wonders in the big smoke as well. Simply take some insanely gawdy decor (think a cross between Willy Wonka’s factory and a pirate ship), add flashing lights, tipsy people looking for a good time, an emphasis on bottle service and a setlist of top 40 remixes and you can’t lose. Crowds of tourists, artists, hipsters and fashionistas pour into the tiny longtangs (Shanghainese alleyways) of Taikang Lu to experience Shanghai’s bohemian charm. The area represents a traditional Shanghainese residential form, shikumen (“stone door houses”), and is now a half-commercial complex selling everything from tailored qipao to French wine. Souvenirs are overpriced, but the ambience is worth sampling. Locals still live in some of these buildings — travelers can see elderly people chatting each other or middle-aged women hanging laundry outside. 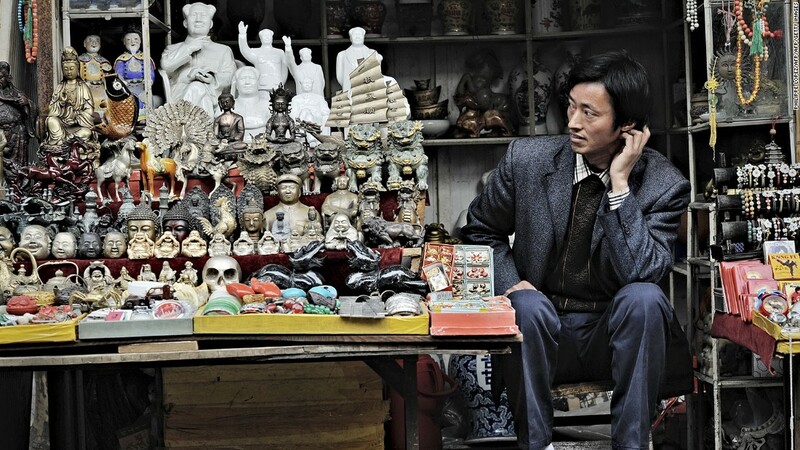 For anyone visiting Shanghai with time for only one market, this outdoor antique bazaar is a good bet. It’s in an enclave of hanging laundry, locals washing vegetables in the street and kids playing tag. Just don’t forget to bargain hard. Many of the “antiques” aren’t old, but they’re fun. Stands sell 1930s-style posters featuring glamorous smiling Shanghai ladies, or statuettes of Chairman Mao playing table tennis (RMB 50 after bargaining). This 23,000-square-meter, multi-level complex is completely devoted to Chinese cha. More than 150 stalls sort, sell and brew tea from around the nation, but green tea (and all its variations) reigns supreme. The market also sells a range of tea sets and kettles, from common porcelain to top-level Yixing clay teapots. Friendly tea sellers will provide professional tips. This three-story fabric market has almost every type of fabric, from cashmere to silk. Stalls are manned by experienced local tailors and seamstresses who speak fluent English. Tailored clothes come at reasonable prices. Qipao (from RMB 250), shirts (from RMB 120) and suits (from RMB 300) are among the most popular items. Some shops accept urgent orders and can deliver final products overnight at (amazingly) no extra charge. Delivery service is available, but the stores need to be informed beforehand. This 10-story Lujiazui building is the top shopping mall experience in Shanghai: it’s loud, crowded and larger than a major university campus. Spread over 247,425 square meters, this Thai-financed mall was the largest in Asia when it opened in 2002. It reports an average of 200,000 visitors daily. The mall sells most of the mainstream fashion brands available in Shanghai. Its dining scene is impressive: nearly 60 restaurants, from hot pot chains to Hooters. A perennially interesting market, traditionally selling pets, flowers, home wares and more, a recent fire means the live animal section of the Hongqiao Bird and Flower Market is currently under renovation. Despite the fact that you won’t be able to pick up a 100-year-old turtle or talking parrot here (for now), it’s still worth a visit in order to wander among the many-hued blossoms of the real and (seriously high-quality) fake flowers on display, or check out some of the unique housewares, which run the gamut from gaudy to graceful to gargantuan (see if you can fit a life-sized white unicorn with an asking price of RMB 22,000 in your luggage!). 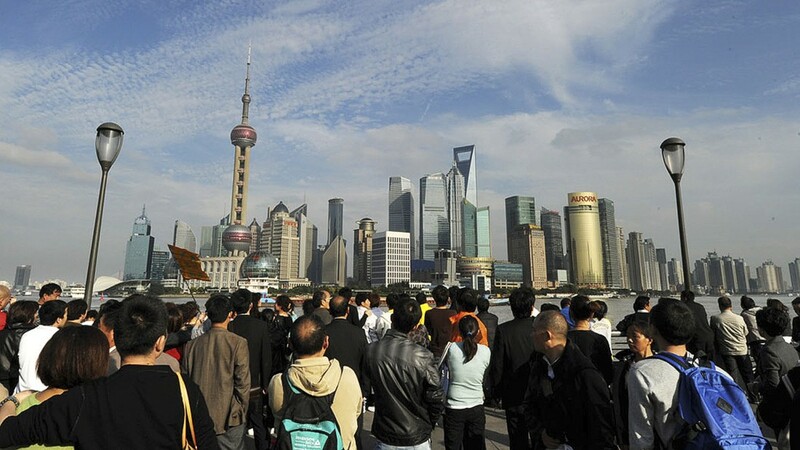 The 1,100-meter waterfront known as the Bund forms Shanghai’s backbone. British and French colonized the strip in the mid-19th century to develop international trading — the Bund became one of the most prosperous ports in Asia in the early-20th century. Nowadays the buildings, mostly built between 1901 and 1930 in various styles, house high-end boutiques, restaurants and bars. A must-do on the Bund stroll is to pass through the revolving door of the former HSBC Shanghai office (today’s No. 12, Zhongshan Dong Yi Lu) and check out the original ceiling and wall paintings. Upon completion in 1925, the Brits declared the building the most exquisite structure in the eastern hemisphere. Just off the Bund, next to the Peninsula Shanghai, is the Rockbund, a newly developed pedestrian street with more restored colonial structures. Almost half a kilometer up in the air (474 meters to be exact), the 55-meter-long Skywalk 100 observation corridor spans a gap in the 100th-floor summit of the Shanghai World Financial Center. As the world’s highest observatory, Skywalk 100 provides a powerful perspective: Jinmao Tower (420.5 meters) is right under its nose and the view (on a clear day) extends beyond Zhongshan Park in Puxi. Walking through the deck is an almost hallucinatory experience: the observatory’s angled glass walls can make visitors feel as if they’re leaning over the edge. And it has see-through glass flooring. A slightly less vertiginous option is the Skywalk 97. It’s a mere 439 meters high, with a glass roof that opens up. This restored compound is one of the most popular attractions in Shanghai. Only 15 years ago, the area was an ordinary shikumen residential area. It’s since been converted to a business district populated by high-end bars, restaurants, shopping malls and the ubiquitous symbol of global gentrification: Starbucks. The location is good for a lazy afternoon walk. It also hosts some of Shanghai’s best foreign restaurant selections. The Shikumen Open House Museum is another highlight. Ironic background: the Communist Party of China was founded on this block — 91 years later it’s capitalism, not communism, that does the talking. Visitors can nevertheless tour the room where the first party congress was held. The City God Temple, or Cheng Huang Miao, is a 600-year-old Daoist temple in the heart of Shanghai’s Old Town. It houses the Cheng Huang God, the deity that protects local people. The phrase also refers to the temple fair and commodity market near the shrine. Although the temple can still be busy with pious religious followers, more people now come for the shopping. Endless stalls sell everything Chinese, from chopstick gift sets to Peking/Sichuan opera mask bottle openers. It’s also the headquarters for Shanghainese snacks, from stinky tofu () to five-flavor bean (). The best time to visit the market is around Christmas, New Year and Lunar New Year when the whole area is blanketed with festive decorations. Heaven for thrill-ride aficionados, the 900,000-square-meter theme park contains nearly 10 different scream machines, including various roller coasters and free-fall rides. Highlights include a 30-meter-tall, 1,200-meter-long lakeside wooden roller coaster and 60-meter-high free-fall drop machine. The super-speed log flume creates a splash as high as 15 meters. The “marriage market” is less tourist attraction and more about a view into unique local culture. Every Saturday and Sunday, hundreds of parents gather at People’s Park, regardless of the weather, with the hope of finding an ideal partner for their high-time-they-got-hitched offspring. Parents simply clutch single sheets of paper that present their children in a few simple phrases — age, height, education, job, salary, whether they studied abroad and whether they own their own apartment. Female candidates outnumber male by far, so enthusiastic parents have a passion for chatting up any young single male in the area. People’s Park ‘marriage market’, Gate 5 of People’s Square Park, 75 Nanjing Xi Lu., across from the Grand Theater. Take Metro line 1, 2 or 8 to People’s Square station, take Exit 9 to the ground level and turn left. The marriage market takes place on Saturday and Sunday afternoons from about noon to three. Planned and built by French colonists in the early 20th century, this neighborhood — roughly bound by Ruijin Lu to the East, Yan’an Lu to the North, Zhaojiabang Lu to the South and Huashan Lu to the West — is more Parisian than Chinese. Its quiet, tree-lined streets now teem with boutiques, bars and restaurants. Best locations to observe lingering “Frenchness” include Anfu Lu, Wukang Lu and Yongkang Lu. Or follow the route designed by a French Concession native. Several agencies in Shanghai provide multi-lingual tours around the former French Concession. Contact Luxury Concierge China or Newman Tours. Shanghai’s art deco heritage is unsurpassed in Asia. Having spent 16 years in Shanghai, architecture buff Spencer Dodington has a matchless knowledge of the city’s art deco history, which he imparts on customized tours. “These lovely buildings got me hooked on the uniqueness of Shanghai 1930s architecture,” says Dodington. Check out Dodington’s favorite art deco structures in Shanghai or join his multi-lingual art deco tour through [email protected] or +86 135 0166 2908. Approximately 300,000 Jews escaped Europe and fled to Shanghai between 1933 and 1941. They lived in the infamous Shanghai Ghetto (now Hongkou District) and made up one of the largest overseas Jewish communities at the time. Led by Israeli Dvir Bar-Gal, these four-hour tours take in some of the most fascinating elements of Shanghai’s Jewish history. As the tour progresses, the story of Shanghai as a melting pot of opium dealers, colonialists, business moguls and Holocaust survivors is gradually unveiled.